Using your time wisely also means determining what tasks need to be done first, how to avoid distractions, and how to get things done when new priorities pop up. When employers ask you questions in an interview about time management, they are trying to gauge how you manage your resources and if you can be flexible and nimble while still producing a quality work product. Being prepared with a thorough, detailed answer that is carefully reasoned will impress a prospective manager. Mentioning how you handle different aspects of time management will set you apart from other candidates, especially if you provide specific examples. Employers want to know you can handle your tasks each day without being directly told each step of what needs to be done. They also want to know you can manage to prioritize work appropriately. You can accomplish this in your answer by saying you create a fresh to-do list for yourself at the beginning of each workday, ordered by a deadline and by the level of importance. Since you know that surprises and interruptions can occur, you create three "must-wins" for yourself of tasks that need to be completed by the end of the business day. You might also explain how you utilize the “80/20 Rule” (also known as “Pareto’s Principle”) to prioritize work tasks. The 80/20 Rule states that, in any project, 20% of the activities yield 80% of the results. Typically, the first 10% and the final 10% of time spent on a project consume the most resources and are the most labor-intensive. Thus, you might explain how you schedule your time so that you can give your full attention to the most critical stages of any given project (typically, the beginning and the end/roll-out). Although there was a time when employees who could do many things at once were valued, recent studies have shown that multitasking is, in general, vastly overrated. Too often people who try to complete multiple tasks at the same time end up doing sloppy work, losing the time they have “saved” when they are subsequently forced to correct their errors. A key element of effective time management is the ability to schedule your time so that you can focus on one thing at a time. If you can demonstrate, with an example or two, your ability to efficiently “single-task” challenging work assignments, you’ll give your interviewer the favorable impression that you are dedicated to providing quality work. Meeting important deadlines is an important aspect of your work. When a potential employer asks how you handle deadlines, emphasize your understanding of processes and of the importance of working ahead. For instance, your answer could be that you work backward from the deadline when planning your approach to a project, breaking it into smaller tasks and setting mini-deadlines for each task leading up to the project's overall due date. In that way, you are continually making progress each day, and you ensure the project is completed on time. Interruptions and distractions are common in the workplace. Your ability to block them out and handle them appropriately is pivotal to your overall performance. Employers are looking for workers who can set firm boundaries, keeping themselves from getting distracted at work by coworkers or fun websites. Mention strategies you put into place, such as wearing headphones to block out chit-chat, putting blocks on your computer for certain chunks of core "work time," and limiting water-cooler gossip. For a good employer, making sure employees are balanced and not stressed or burned out is important for company morale and productivity. When employers ask about this, they are not looking for someone to say "work is my life" or that they have no hobbies or obligations outside of the workplace; managers know that is not healthy. Instead, focus your answer on how you give your full effort at work and are completely present while you are on the clock, and that your efficiency allows you to disconnect when you are at home. 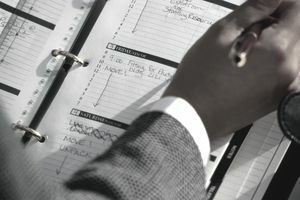 Time management questions can be tricky, as managers are looking for more information than just how you use your time. Focus your answers on these important factors to demonstrate your effectiveness and productivity.